Feb 18th 2015, 2 years, 13 days in Pretoria Central Prison: last 4 were released. Feb 20, 2015, all Congolese 20 acquitted!!!!! Allelujah! Huge victory for the South African justice system!!!!!!!! 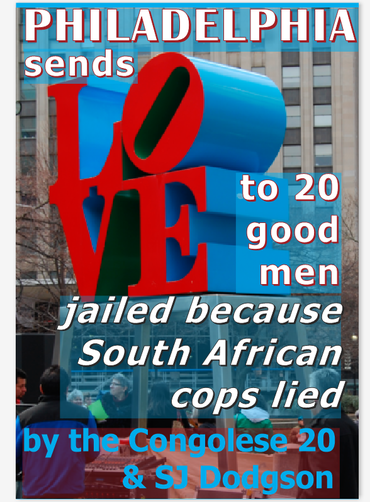 Philadelphia sends love to 20 good men jailed because South African cops lied. If you, unlike everyone else in the known universe, wants to buy a copy, send email to publisher@mjota.org. I told my good friends in Pretoria Central Prison, when they told me that Judge Mothle laughed at some prosecutor nonsense, that when they were released, it would happen very quickly, when they were not expecting it, just like their arrest. And it did in November, for 15 of them, when they were released on the day we celebrate Thanksgiving in New Jersey. I am a non-drinker, but on that day, with my 4 children, I drank 3 glasses of wine. Small glasses. Red. One glass was for the release of 15. The second was for the 5 remaining in jail. The third was for the miracle of being with all of my 4 children, all adults, in the same room for an hour. The day after the first 15 were released, Etienne Kabila was granted bail, but the other four were not. The other four remained in jail over Christmas and New Year, and were only released on Feb 18, without any warning, two days before all five were formally acquitted. The hardest part of remaining in jail was missing their children, all young. James has 3 American boys in Delaware. Chadrien has 4 South African children in Johannesburg. Jeff has 5 South African daughters in Johannesburg. Patrick has 4 sons, and a daughter who was 2 months old when her Daddy was arrested. The hardest part of being out of jail for James and Chadrien is still not being able to see their children. Two years in jail removed Chadrien's children from him, and impoverished James' wife in Delaware. She is looking hard for money for James's ticket back to Delaware. South African police were found to be liars because they could not come up with a believable story after 2 years of trial in North Gauteng High Court. Unfortunately, acquittal of charges, which looks to me miraculous, does not put food on the table for the men. It does not bring back the wives who divorced their husbands It does not bring back Alain's wife, mother of 3 children, who died on Feb 12, at the age of 33. It does not bring back Chadrien's internet cafe, or his business or his property. It does not stop several of the men from sleeping in churches, unable to get back to their families. When the men were released, the shackles were removed, the doors were opened and they permitted to leave. No apologies, no cash compensation. Only harassment by South African Home Affairs and lack of ability of United Nations High Commission for Refugees to resettle 19 families, which amounts to over 100 adults and children. I am asking South African Home Affairs to stop harassing these men, these fathers of South African learners, and grant them South African citizenship. Immediately. I am asking the South African police to return a valid ticket to James. Immediately. He had a valid ticket home to Delaware when you made up this nonsense that a 2-week stay in South Africa was a 6-month military training camp. The greatest miracle of all is that except for James, all of the men love South Africa and want to stay in South Africa. They are all elated that the South African justice system works, and extremely proud of how their children re doing in school. South Africa is a country of miracles. We need more miracles for 20 good men. Give 19 of them South African citizenship. And James his ticket home. Fire Colonel Noel G Zeeman! We don't know why he lies, but we do know harassment of Congolese 20 lawyers and the 15 acquitted continues to this day! The trial started with him giving a 52-page affidavit of evidence of attempted murder and plotted coup d'etat against DRC-Congo president who calls himself Joseph Kabila. All fiction! Colonel Zeeman made it up! And the prosecutor dropped all charges against 15 because Colonel Zeeman could not provide a single witness, or document, or photograph, that supported his affidavit. The real threat to South African security is Colonel Zeeman, a highly placed officer who is happily working for the government of DRC-Congo. Colonel Zeeman is working for the man who calls himself Joseph Kabila and never sleeps in the country he is president of! Where I come from, Colonel Zeeman is committing treason. On Jan 26, 2015, Colonel Zeeman stepped down. In South Africa, rogue police lured 19 honest men into a trap by promising them training and jobs as anti-rhino poachers, in order to catch the 20th, who is the brother of the president of Congo. On Feb 5, 2013, 19 men were arrested in a hail of bullets in Limpopo, in South Africa's north east. On Feb 8, 2013, over 1,000 miles south west, Etienne Kabila handed himself in after seeing international news reports that he was wanted. In Dec 2014, 5 men remain in Pretoria Central Prison, undergoing trial with no evidence; everything was fabricated by South African cops, led by Colonel Noel Zeeman. Dr Susanna Dodgson traveled to Pretoria Central Prison in May 2013 to find out why Congolese-born America James Kazongo traveled from Philadelphia to South Africa, and why this family man, student and good man was in prison. The book is a collection of stories by and about the Congolese 20 edited by SJ Dodgson aka Dr Susanna. Mar 20, 2015: Tributes are gushing all around the world for a brave freedom fighter against apartheid, Danny Schechter, whose last breath left in New York City last night after 72 years. Danny was the first to believe my story that 20 men were jailed because South African cops lied; the first to believe my claim that we could get them out by talking about it. After 2 long years in jail, they were all acquitted. He fought a good fight right to the end, and he taught so many who have risen to take his place. Lives don't get lived better than his. He made films about apartheid, he made films about Nelson Mandela, he loved South Africa with a passion. He was a leader in the global fight against apartheid, which only was overthrown because good people stood up and said this is wrong, and we are not going to sit down until humans are given rights in South Africa. And he never stopped fighting for human rights and decency. He was pure electricity. No wonder Nelson Mandela loved him. Etienne Kabila was released on bail one day after charges were dropped against 15 of the good men on Nov 28, 2014. The wives of the 4 men inside, the wives who faithfully visited their husbands and brought food and supplies to all 20 good men: they managed to raise bail money for the 4 good men left inside. Two months later, and several bail hearings later, the 4 good men remain in jail and on trial, but the case which crumbled considerably on Nov 28, is in complete collapse. When the trial resumed on Jan 26, Colonel Zeeman resigned from the case. The chief witness resigned. The chief witness ran away. The man who made up the lies, made up the sting, decided he was spending far too much time away from his family. Having deprived 20 good men of their families for 2 years. The 15 men who were released on Nov 28, 2014, are being harassed by South African officials. Because they are from Congo and the target of apartheid evil moved from attacking Black South Africans, to attacking Congolese and other African refugees. Clever trick by supporters of apartheid to divide Black Africans and Black South Africans. Alain's wife is in a coma in Johannesburg Hospital. A few of the good men have been reunited with their wives and families, but most are not. Some wives ended their relationships, some wives are far away from Johannesburg and Pretoria. We have such simple requests. We ask the courts to acquit the remaining men, and we ask the South African government to give rapidly work permits to all of the 20 good men. All 20 good men have children. Most children were born free in South Africa, who are South Africans and are being brought up to be hard-working citizens. Every man arrested fell into an evil trap because they believed South African government officials offered them jobs. Not a handout, not a gift, but the opportunity to work hard. That is all they ask. James Kazongo, the mild-manned chef and family-man from the Delaware burbs, is really a super-hero capable of planning, attacking and conquering DRC Congo from 2 countries away, even though 20 years of Rwandan rebels have not been able to with 15 years of United Nations intervention. Who knew. When I saw James' tax returns from Jan 2013, which he completed early to get a refund to pay his fare to visit South Africa for 2 weeks from mid-Jan 2013, his work documents looked like that of a struggling family man who had worked for several employers during 2012, paying taxes, paying bills. But not according to the charges for which he is on trial in North Gauteng High Court. The prosecutors claim he must have flown himself over to South Africa each night, spouted revolution, rounded up ammunition and armies and soldiers, and then nipped back so that he was in bed when his wife and kids awoke every morning. So he could take them to school when his wife was working long shifts as a certified nurse's aide. And continue his studies. And work as a chef. And play guitar and teach his boys how to play football. This is the sort of nonsense that has been discussed in North Gauteng High Court, where the Judge Billie Mothle and the prosecutor are hell-bent on getting a conviction for James Kazongo, and 3 other decent family men, all computer nerds and small businessmen: Chadrien, Patrick and Jeff. You can read about them in the book they wrote, "Philadelphia sends love to 20 good men jailed because South African cops lied". Last Wednesday, Judge Mothle told the prosecutors they had until Monday to produce documents showing that James Kazongo, while sleeping in Delaware, was making nightly visits to South Africa. Monday came, the prosecutors did not produce documents, and Monthle said that did not matter, the men were still going to be tried. The red flag was raised on Monday Jan 26, when the trial continued after a hiatus after 15 good men were acquitted and Etienne Kabila was released on bail. The red flag of the blinding of justice and decency was that all media were henceforth banned from the court-room. No-one is allowed to witness the trial, report on it. The South African newspapers that were so happily celebrating with the 16 released men, have been silenced. Because nonsense is going on in North Gauteng High Court. Is Judge Billie Mothle being threatened, or bribed? Given his background, and brilliance, I cannot believe he can be either threatened or bribed. But why did he go back on his word? What is going on? What about the prosecutor, Mr Pretorius? How can a trial continue when the chief accuser, Colonel Zeeman, has resigned? This trial is turning into a comic. I wish James was a super-hero and could fly back to his wife and sons in Delaware. They need him. Publication date Sat, Dec 20, 2014. Thank you those who joined us virtually or in person in New Jersey through our Facebook event page "Philadelphia sends love to 20 good men jailed because South African cops lied."